Pastor Mark Moore – Faith Covenant Church PRAISE BREAK!!! Posted by admin. Categories: Church Covenant. Tags: break, Church, Covenant, Faith, mark, Moore, Pastor, praise. Comments Off on Pastor Mark Moore – Faith Covenant Church PRAISE BREAK!!! Lord’s Prayer, Faith Hope Love Charm Twist Bangle Inspirational Bracelet in a Gift Box by Jewelry Nexus ” Our Father which art in heaven, Hallowed be thy name. thy kingdon come, Thy will be done in eart, as it is in heaven”. Jewelry Nexus is dedicated to introducing jewelry that fits the lifestyle of today’s woman. Quality product and first-class customer service have contributed to Jewelry Nexus reputation. Posted by admin. Categories: Church Names. 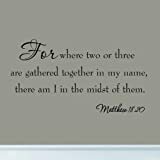 Tags: 'Father, Bangle, Bracelet, CHARM, come, Done, eart, Faith, Gift, Hallowed, Heaven, Hope, Inspirational, Jewelry, kingdon, Lord's, love, Name, Nexus, Prayer, Twist. Comments Off on Lord’s Prayer, Faith Hope Love Charm Twist Bangle Inspirational Bracelet in a Gift Box by Jewelry Nexus ” Our Father which art in heaven, Hallowed be thy name. thy kingdon come, Thy will be done in eart, as it is in heaven”. To the left of the pulpit platform, this stained glass window represents the Apostle Paul. 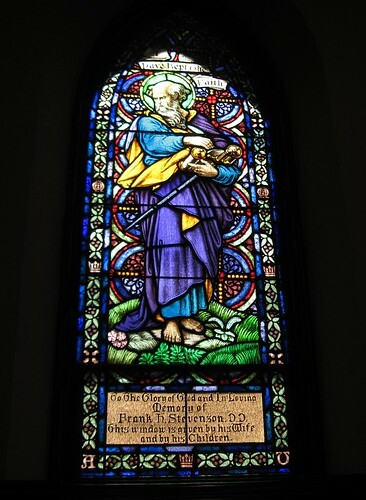 It is a memorial to the Reverend Frank H. Stevenson, D.D., faithful pastor of the church from 1915 to 1927. The Covenant First Presbyterian Church is a congregation of the Presbyterian Church (USA) located at 717 Elm Street at Eighth Street and Garfield Place in Cincinnati, Ohio. Two churches, the First Presbyterian and Covenant Presbyterian merged in the 1933 to become the Covenant First Presbyterian Church. The first Presbyterian Church in Cincinnati was on the north side of Fourth Street near Main and was organized October 16, 1790. First Presbyterian was organized October 16, 1790, the first pastor being James Kemper. Kemper’s log cabin is preserved in Sharon Woods Park in Sharonville, OH. Second Presbyterian grew out of First Presbyterian in 1816. After moving to various locations in downtown Cincinnati, Second Presbyterian settled into the present location at the corner of 8th and Elm streets. In 1833, Lyman Beecher was called as pastor of Second Presbyterian and president of Lane Theological Seminary. During his tenure in town, he had a falling out with Joshua Lacy Wilson, the pastor of First Presbyterian. Wilson eventually charged Beecher with heresy. Though Beecher was acquitted by the higher governing bodies of the church, his ministry was compromised, and he left in 1843. The present Church building was dedicated April 11, 1875. The Gothic style church was constructed, facing Piatt Park, of handcut stone from the quarries of church member Colonel Peter Rudolph Neff. The belfry remains as originally constructed and contains a huge bell bearing the old inscription in bold relief, "Revere, Boston." The unusual interior arrangement is said to have its origin in the seventeenth century Gothic tithing -barns of the Scottish-English border country. The pulpit furniture was carved from black walnut by Henry L. Fry.